How will the second half of the 2017 Formula 1 season pan out? Nine races remain in what has been a scintillating 2017 Formula 1 season. Ferrari’s Sebastian Vettel leads the Mercedes duo of Lewis Hamilton and Valtteri Bottas by 14 and 33 points respectively. It is by far the tightest season in F1 since the turbocharged engines returned to the sport. Controversial collisions, team orders and the extreme speeds boasted by this new generation of chassis, as well as the fascinating battle between Mercedes and Ferrari has been the theme for much of this season. These are likely to carry on through until the end of the year, and hopefully it will all come down to an epic showdown in the dusk at Abu Dhabi in November. That assumes that the development race continues as it has throughout this year so far. The Mercedes W08 appears to be superior in qualifying to its direct rival, Ferrari’s SF70H, although it was at its furthest away at the most recent round at Hungary in terms of outright one-lap pace. However there doesn’t seem to be a clear advantage over a race distance, with both outfits arguably losing out on wins the other inherited. Reliability has affected the Brackley-based team more than the Maranello-based one, albeit just. Mercedes has had a single retirement due to a mechanical problem (Bottas at Spain) while Ferrari is yet to suffer from one. In addition, Mercedes has had to take two gearbox penalties in recent races, and this has compromised its drivers. In terms of power unit usage, it is almost even between the two marques. The same, however, cannot be said of Red Bull, which is already eating up its supply of TAG-Heuer-badged Renault power unit components. Yet Red Bull could well still be a factor in this. Team principal Christian Horner has set his team a target of outscoring Ferrari in the second half of the season, which would imply that it is capable of regularly challenging the top two teams or anticipates Ferrari dropping back. Mercedes is tipped to come out on top in this fascinating development race, which could swing the title back in its favour. Is Ferrari about to hit the metaphoric development ceiling with its current car? Red Bull regularly taking points away from Ferrari and Vettel could leave a two-horse race at the conclusion of this season, and neither horse would be Prancing in this case. However, Vettel’s slender points advantage and his near-perfect performances in 2017 may keep him in this fight until the end. He has been the driver of the season to date and is notorious for having stellar runs post-summer break when a championship is on the line. It would be very unwise to count out the championship leader, even if Mercedes finds a tenth or two over Ferrari and Red Bull does indeed catch up. But what of the rest of the field? McLaren and Renault have both made huge leaps forward as the season has progressed, and Fernando Alonso and Nico Hulkenberg are doing stellar jobs in sub-standard machinery. Those teams sit at the wrong end of the championship standings and could well improve up the order before the end of the year. Catching up to the vastly-overperforming Force India (and its pair of vastly-overperforming drivers) might be a challenge though. Williams also has a handy package, and Lance Stroll’s gradual rise to form should be an asset alongside a rejuvenated Felipe Massa. This will likely leave Sauber at the tail-end of the field for the remainder of the year, and unable to improve on its current position at the bottom of the championship. Sauber held onto ninth in the standings until the most recent race at Hungary, before a double points finish for McLaren shoved them to the tail of the order. But what of the team-mate battles? Initially one-sided affairs such as the battles at McLaren, Force India and at Williams has shifted slightly in recent races as rookies start to find form over their respective team-mates of vast experience. Bottas has notched up five podiums in five races and is threatening what was assumed by many to be a ‘Number One’ status held by Hamilton at Mercedes. 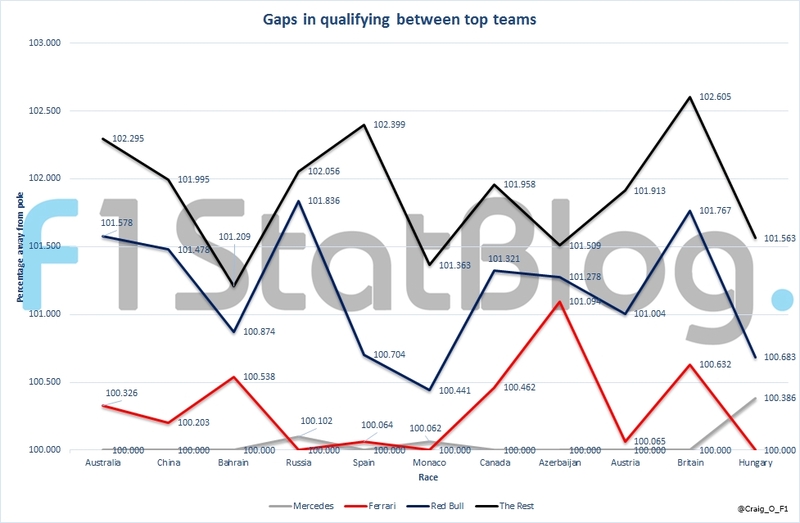 A battle so drastically skewed by reliability and collisions is starting to swing back in the favour of Max Verstappen and away from Daniel Ricciardo at Red Bull, and Daniil Kvyat will aim to start translating strong qualifying performances into some desperately-needed points at Toro Rosso. He also needs to behave, as he is sitting very close to being slapped with a race ban. At teams such as Haas and Sauber, the battles are often too close to call. Things might shift towards one driver or the other, or it could remain tight throughout the remainder of the year. Both Pascal Wehrlein and Kevin Magnussen really need to perform against their more experienced team-mates this year, and edging them may just salvage their respective reputations. This season may be impossible to salvage for Jolyon Palmer and Kimi Raikkonen, however. Palmer, who has been given inferior machinery by Renault due to his woeful start to the season, has shown very little which would imply that he is about to start matching, let alone beating team-mate Hulkenberg. Raikkonen is in a different situation. The Finn may have to play a supporting role to Vettel, given that he is so many points behind at this stage, and is all but out of championship contention. Some of our predictions appear to have completely gone out of the window at this stage. The upgrades brought to Belgium and beyond will be fascinating to see. Whether momentum shifts from one outfit to another during the remainder of the year. Ideally both championships will be decided in Abu Dhabi, and hopefully in a thrilling manner.